The eighth season of American Horror Story premiered last night with a nuclear bomb heard around the world and spoiler alert: there weren’t enough hazmat suits to go around. It debuted to much fanfare following announcements that this season would finally be the long-awaited Murder House/Coven crossover, and that Jessica Lange would be reprising her role as Constance Langdon. What does that have to do with the premiere’s explosive apocalypse of doom? Beats me, but it was captivating nonetheless. AHS of late has taken joy in toying with our many societal fears (which at this point should be enough to fuel the show until an actual apocalypse happens). Following in the footsteps of last year’s Cult, our current fragility was put on blast, literally and figuratively, with a gripping sequence full of air horns and panic as a rich diva (Leslie Grossman), her assistant (Billie Lourd), hair stylist (Evan Peters) and the stylist’s grandmother (Joan Collins) all rush to catch a plane set to save them from the world’s impending doom. At the same time, a teenage boy is plucked from his family by armed guards dressed in black, agents of a mysterious group called the Cooperative that is hand-selecting survivors based on their genetic make-up. These initial scenes set the stage well. A family torn apart pulls at heartstrings, while a newscaster’s final goodbye to his family on-the-air is a staggering moment of simultaneous horror and love. The survivors meet up in a dark compound, saved from the blast’s radioactive material but not at all freed from danger. 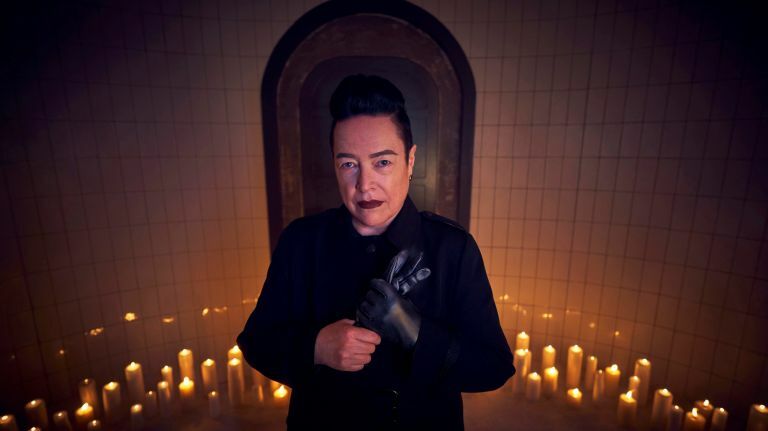 Outpost 3, as it’s called, is headed by Sarah Paulson’s icy Wilhemina Venable and Kathy Bates’ militant Miriam Mead. The set-up is purely psychological warfare; while the “Purples” are led to believe they are special, they’re to follow strict rules that make them feel more like prisoners instead of chosen ones. The mystery compounds, hinting at the leaders’ likely sinister side-plan that’s yet to be revealed. Eighteen months pass as conditions get progressively worse (and possibly cannibalistic…mmm stew!) until a tall, dark and probably evil man enters to reveal that other Outpost locations have failed and that he is there to decide who will live and be showered with a decade’s worth of food, and who is unworthy of being spared. The man reveals himself to be Michael Langdon, the Antichrist from Murder House—the offspring of Vivian Harmon and mass murderer Tate. Although Michael was the premiere’s only real link to the crossover we were promised, the callback to Murder House was enough to whet our appetites. The show’s first season created a boom in anthology storytelling with its layered timelines, huge reveals and award-worthy performances from Lange, Peters and Frances Conroy, in particular. The show, then and now, is at its best when it focuses on our desperation, pain and regrets. Murder House maid Moira agonized in perpetuity for truth; Ben Harmon’s guilt ate him alive and blinded him to horrors right in front of his face; Tate and Constance longed to connect with their humanity but were ultimately unable to escape their pasts. AHS has never been a show that shies away from pathos and tragedy. In some ways, it’s surprising that AHS took so long to get to the End of Days. Oddly enough, the new story seems to be sustainable on its own. How these older characters, let alone the witches, will fit into the Apocalypse narrative remains to be seen. It’s no secret that the series is often criticized for trying to fit too much story into so little time, and of note, this season is only set for a condensed 10-episode run. While our anxieties will (hopefully) continue to be poked and prodded, Apocalypse feels like it could return the franchise to the camp and escapism that made AHS such a horrific delight in the first place. While the series’ ambition could again wind up being its greatest weakness (Freak Show, anyone? ), I’m remaining optimistic. -There’s always gotta be a shadowy corporation or Cooperative, aye? Who’s behind it? Does this person or the Cooperative at large control the Coven too? Or maybe the Coven is part of the Cooperative? Color me intrigued. -Will Michael Langdon grant Peters’ hair stylist immunity? Who’s going to look after that voluptuous lion’s mane for him during a friggin’ apocalypse!? -Miss Robichaux’s Academy for Exceptional Young Ladies has got to be an Outpost. Will this be the Outpost that Langdon takes his chosen few to? Will Constance be there waiting when we arrive? Bring me all the Jessica Lange! Let me know your thoughts in as much detail as possible, plz.